After a fun three days in Chicago, it was time to hit the road again. This time we were heading north to Isle Royale National Park, an island in Lake Superior accessible by ferry from Grand Portage, Minnesota. Making the trek in one day was a bit more than we could handle, however, so we planned for a night of camping at Minneopa State Park in southern Minnesota. Getting there took us through four states in a single day: Illinois, Wisconsin, Iowa and Minnesota. First we headed north on I-90 out of Chicago to Madison, Wisconsin, where we stopped to explore a cool Saturday market at the capital building. The Dane County Farmers’ Market takes place each Saturday from April-November, 6am-2pm on the capital square in Madison. If you’re passing through at the right time, it’s worth a stop. The market attracts a big crowd, so you have to deal with the slow moving masses, but there are lots of enticing fruits, veggies, cheeses, breads and other goodies for sale. It could be a great way to piece together a winning picnic! I bought some smoked cheddar and hot and spicy cheese bread, two appropriately Wisconsin purchases, in my opinion. They made delicious supplements for our picnic an hour or so later, at Blue Mound State Park, west of the city. The park offers some nice eating areas and a lookout tower that provides a great view of the surrounding farmlands. After lunch we continued traveling west, crossing the mighty Mississippi River at Prairie du Chien, Wisconsin into Iowa. Our path took us past Effigy Mounds National Monument in Harpers Ferry, Iowa, where we stopped for a quick walk. Many consider the monument sacred land, and it is an interesting stop. 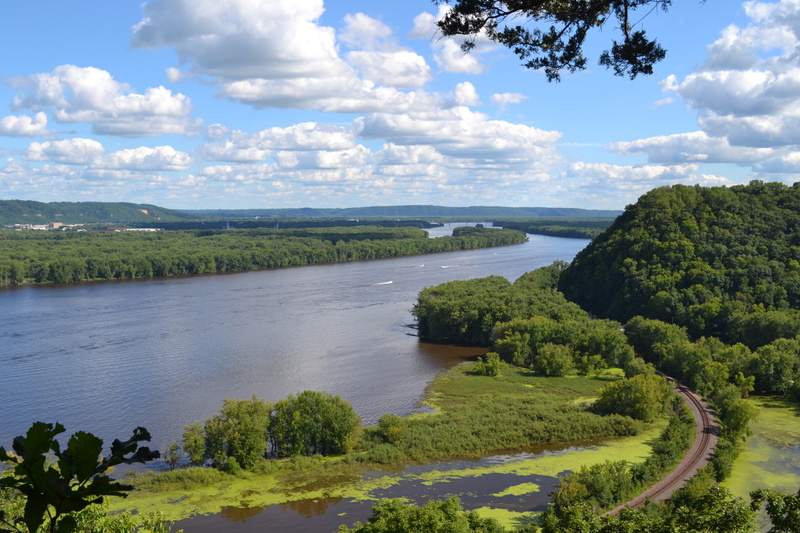 Sadly, our schedule didn’t afford us enough time to explore the site extensively, but we were able to take a half hour walk (round trip) to check out a great viewpoint overlooking the Mississippi. Then it was on to Decorah, a tiny town in northern Iowa where we stopped for a coffee and a quick supermarket run to grab dinner food before the final leg of our trip. The day’s drive through Wisconsin, Iowa and southern Minnesota was truly lovely. We were surrounded by rolling hills of corn, perfectly spaced puffy white clouds and picturesque farms. We also drove through several small towns, with populations in the low hundreds. I read each population size aloud as we passed the signs, wondering what it must be like to grow up in that America, certainly a very different American experience from what I’ve known. The drive through the heartland far exceeded my expectations. It provided stereotypically perfect images of American farmland. The ride was so enjoyable in fact, that I didn’t even mind that it was almost dark when we finally arrived at our Minnesota campsite, with barely enough time to set up camp and start a fire before we were engulfed in darkness. Day two of our trek to Grand Portage took us further north, through Minneapolis and on to Banning State Park, where we stopped for lunch. I can’t give a very positive review of Banning as it was completely overrun with mosquitos, which made our lunch experience less than enjoyable. I covered up, applied bug spray and still got attacked. I struggle with the devil bugs in general – my blood must be delicious because they are drawn to me – so I gobbled down my lunch quickly and headed back to the car, insisting that we move on. After hitting Duluth, we were on to a scenic roadway running along Lake Superior that afforded some nice views of the water. Our final stop before Grand Portage was Split Rock Lighthouse State Park – definitely worth a visit. 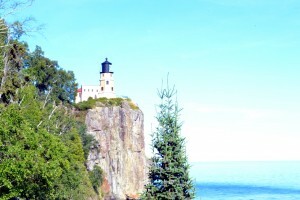 The $10 entry fee gets you a guided tour of the area and free roam of the lighthouse, surrounding buildings and the park, including a walkway down to the shoreline. It’s a lovely spot, with some incredible views. From there we continued heading north to Grand Portage, MN, a mere seven miles from the Canadian border. There doesn’t seem to be much happening in Grand Portage – it’s a bit of a one-horse town. We looked for a place to eat dinner and Yelp returned one option: the Grand Portage Lodge and Casino restaurant. We were staying the night there, so the location was convenient, but the food was mediocre at best. The menu was basically meat and carbs. The lodge itself was under construction when we were there, but the room was fine and the bed was very comfortable, which was all we really needed.